Of Power, Predators And Innocent Mistakes: The Complex Problems Of Sexual Harassment Writer Cathy Young says the outcry against sexual harassment may be going too far — that punishments don't fit the alleged crimes. Podcaster Kaitlin Prest says people still don't understand consent. 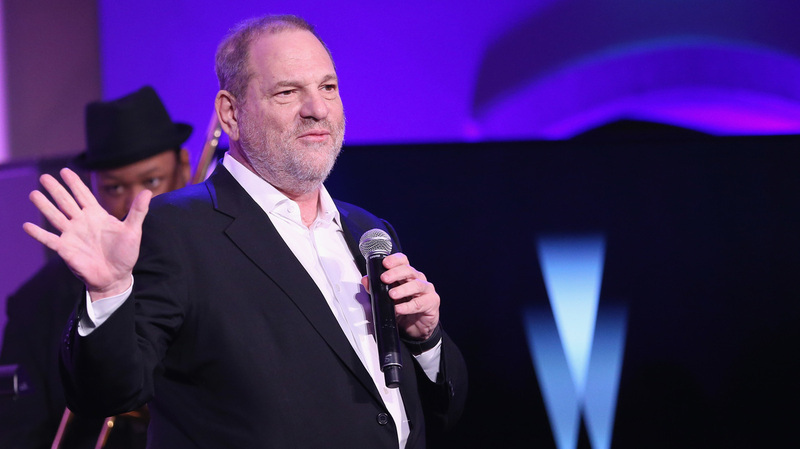 Harvey Weinstein faces very serious accusations of sexual assault. But one writer thinks many men are being unfairly caught up in less serious accusations. A national conversation has begun about sexual harassment. But there are times when some people disagree on what that phrase means. In a recent example, NPR's former news boss Mike Oreskes was forced to resign this past week due to multiple accusations of sexual harassment. NPR's David Folkenflik detailed the numerous allegations of Oreskes' inappropriate behavior. When "taken together, the allegations involving Oreskes paint an ominous picture of an executive willing to abuse his authority," Folkenflik writes. But "[s]ome of the incidents, in isolation, might not appear consequential." A former NPR editor who was pressured to meet Oreskes for dinner "found the experience bewildering as she tried to sort out whether what she had experienced was truly sexual harassment." One person says she has been sexually assaulted while another calls the same incident "innocent." NPR's newsroom uses Webster's New World College Dictionary, which defines "sexual harassment" as: "inappropriate, unwelcome, and, typically, persistent behavior, as by an employer or co-worker, that is sexual in nature, specif. when actionable under federal or state statutes." NPR's Weekend Edition asked men around the country what behavior they thought crosses the line from something less serious to harassment. "Any line where the other person is uncomfortable or feeling like they're being harassed or assaulted — that's the line for me," says 25-year-old Wade Hankin of Seattle. He says he was raised by a feminist mom, surrounded by strong women he loved and respected and has thought deeply about issues of consent. But a friend told him he crossed a line himself. Four years ago he was "blacked-out drunk" at a Halloween party, Hankin tells NPR's Lulu Garcia-Navarro on Weekend Edition. "I was slapping and grabbing my two friends' behinds. And neither of them liked it." "I felt it was necessary to say something about it and say how sorry I am," he says. He wrote about the experience on social media. He agreed to let NPR use his full name; his recounting of something he's not proud of will come up on Google searches of his name. "We only ever hear women's allegations. Women saying what has happened to them. If there is any word from a man, it's deny. It's suing. It's, 'I never did this,' " Hankin says is the reason why he responded in such a public way. "It's never: 'This is what I have done. I am so sorry.' It's never taking responsibility for actions." Writer Cathy Young, a contributing editor for the libertarian Reason magazine, thinks some of the outcry — she calls it "Weinsteining" — has gone too far. "Obviously I think we can all get behind people like Harvey Weinstein, or you know, Mark Halperin, being exposed for apparent very, very serious misconduct toward subordinates and co-workers," she tells NPR. "It may not be admirable conduct, but at the same time, I really don't think that that sort of thing — where there was no hint of retaliation, no hint of him exploiting his status to coerce a sexual contact — should be treated the same as these people who are engaging in clearly criminal conduct," Young says. "I don't think that we need to be concerned about taking it too far," responds Kaitlin Prest, host of The Heart podcast. "There's an entire spectrum of inappropriate behavior that happens. And especially when you take that into the workplace, those seemingly innocuous behaviors are — those are microaggressions. Those are the small things that chip away at someone's feeling of professional value in the workplace," Prest says. A woman could feel "the only reason why she's here is boss man likes to look at her breasts." Prest would rather have a "better safe than sorry" office environment. "I think we're so far away from understanding what consent means," she says. It has to do with understanding power dynamics at work, where most of us have bosses. "You want your boss to like you, so you feel like you have to say yes to everything," she says. "They ask you to go out for drinks after work — you say yes automatically because you want to have this person's favor." Young concedes that "there are very real power differentials in the workplace." But she's "concerned about this mindset that we have to constantly police for microaggressions — which, a lot of that is defined very subjectively." She thinks there's a danger of glances being misinterpreted, and of "seeing offenses where none exist." "I don't think most people really have that much trouble understanding consent," Young says. "I think genuine miscommunications and genuine mixed signals really do happen." Prest strongly disagrees with that assessment. "I don't think that we're overreacting," she says. "This is the first time where you're hearing people who have perpetrated that type of harassment actually investigating their behavior." Prest says "the pendulum needs to swing a little bit farther into this extreme before we can get back to the middle." But Prest says she and Young can agree on asking the same question. "I do think the question of what accountability looks like is a huge question that we need to be asking right now, and a really, really important question that I don't think we have the answer to — at all." NPR's Ravenna Koenig and Adelina Lancianese contributed to this report.